Free H5 Game Glorious Saga Released by InstntFuns Platform! The free-to-play Glorious Saga like action game crusaders quest is one of the year's most ambitious PC released by Instantfuns. Glorious Saga is a horizontal-style RPG h5 game with great battling effects and beautiful graphics. Furthermore, the game is based on the movie of warcraft which can be accessed by using Web, Mobile and PC. Soon players everywhere will have a chance to try it out. In fact, the game has been adapted to a variety of game types, today I’ll introduce you a instantfuns’ new H5 game, glorious saga. Dungeons include Pets Instances, Gear Instances, Sets Instances, Gems Instance, Gold Instances and Mounts Instances. Clear Stage 8 to activate Dungeons. Raiding the instances can not only obtain rewards, but also improve heroes’ stats by using the rewards. Level BOSS: Defeat Level BOSS for chances to drop Orange Defense Gear and Orange Shards. Level BOSS will refresh when CD time is over (6 hours). When player reach certain levels, the BOSS that current level can challenge will be activated. 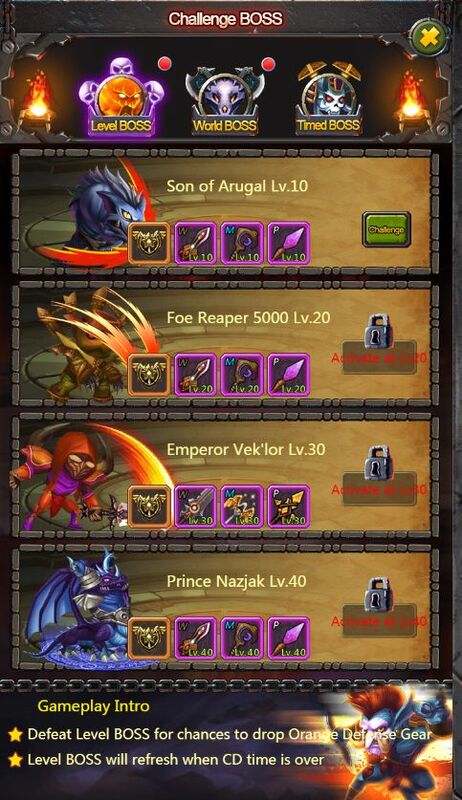 World BOSS: All players of this server can join in World BOSS. You can challenge BOSS level which are 10 levels above or below (only whole number). Challenge each BOSS 5 times/day, and BOSS will CD before refreshing. The CD time for each BOSS is 2 minutes. Timed BOSS: Players of this sever can join in Timed BOSS. After the BOSS refreshes, player have 30 minutes to kill it. BOSS refreshes for 24 hours. Enhance: To increase BP, player can upgrade Gears’ level by using Gold and Enhancing Stones. Star Up: Star Up can increase the bonus stats of gears. Change: Player can choose sets or parts for heroes via changing Gears. Enchant: Reach Lv60 to activate Enchantment. 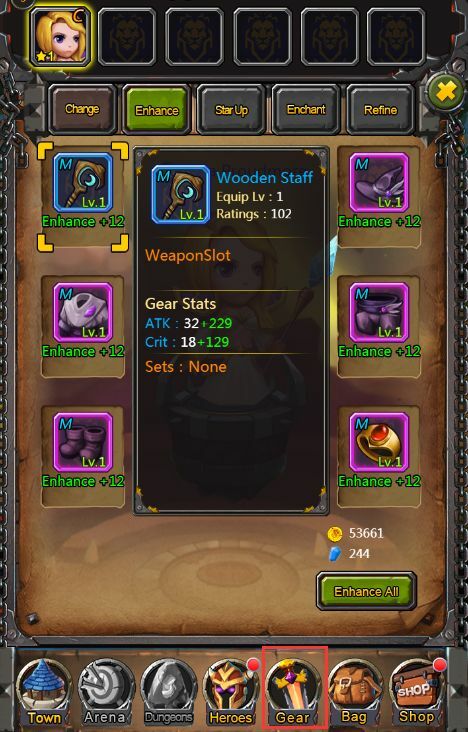 Enchanting Scrolls include 3 types: Weapon, Armor and Accessory. Each type has 3 qualities: Pri, Med, and Adv. Higher quality means higher Max stats. Refine: Reach Lv100 to activate Refine. It requires Refining Stones. More refining times means higher stats and BP. This also consumes more Refining Stones. If you are interested in the game glorious saga, join and start your magical trip!